The Fly Father is a departure from traditional Protech knives, but it retains the classic blade shape of the Godfather/Godson knives and their incredible fit and finish. The blade on this knife is 154-CM steel with a stonewashed finish. The front side of the blade has the Protech logo. The handle is comprised of titanium slabs with beveled edges and grooves along the sides. The titanium frame has zen pins and barrel spacer construction, while the pivot features 56 ball bearings (14 per pivot side) and set-screw pivots that allow the user to adjust the tension on the blade for smooth and precise action. 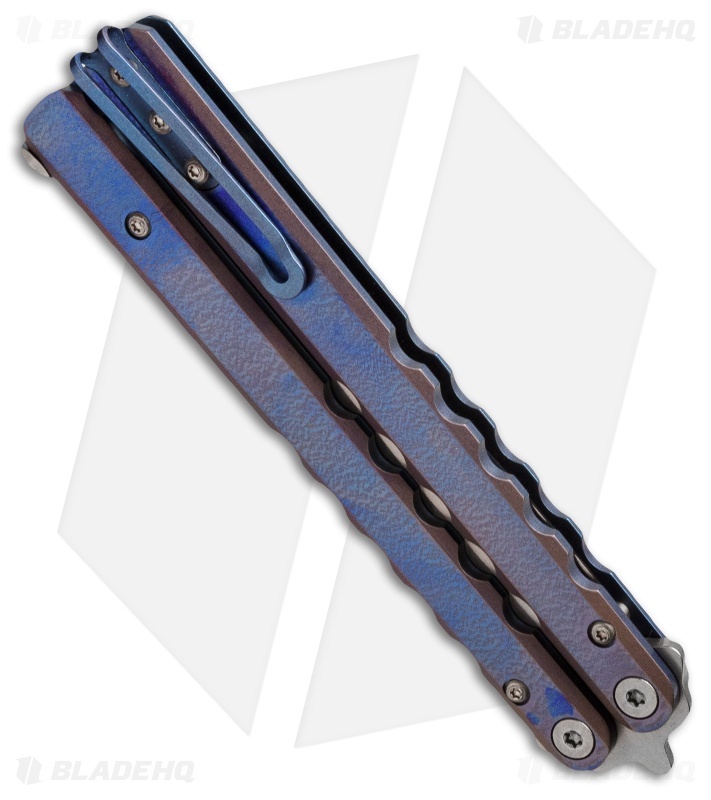 The latch is quite unique and a work of art itself! It is an arc shape, which allows the blade to extend closer to the bottom edge of the handle when closed. It's a nice touch that makes it possible to have a longer blade than is otherwise possible. The latch also has the unique feature of an integral latch stop which keeps it from hitting the blade! Includes matching anodized pocket clip. The FlyFather follows the tradition of other Protech Knives with attention to detail and exceptional fit and finish. The FlyFather is very well thought out and a great addition to not only Protech's line, but the Balisong community. This FlyFather has orange peel texture blue/purple anodized handles.